Free as a human is a rally to end the sexual exploitation of young girls; the use of child labor and the enslavement of humankind. The fashion initiative was founded in january 2018 by fashion designer and social activist anyango mpinga, to combat human trafficking and raise awareness against the social and economic injustices that occur within the fashion industry. Anyango’s contemporary slow fashion brand is renowned for advocating sustainable manufacturing practices, with a transparent supply chain, which ensures workers are paid fairly and are employed under safe working conditions. Trafficking in the manufacturing supply chain- the issue of the use of forced labor in the fashion industry has been a discussion over the years. Many brands cannot ascertain that their supply chain is free of forced labor and there is a necessity for more players in the fashion industry to demand transparency and adopt a more sustainable approach in their process of creating their wearable art. Free as a human is an artistic endeavour whose pilot project is supporting the fundraising efforts of haart kenya. Anyango has designed a limited range of branded merchandise for sale. For each item purchased, all profits are donated to the shelter for female victims of trafficking, run by haart kenya. The funds raised will be used to build a sustainable shelter for underaged unaccompanied female victims of human trafficking and also put towards the running costs of the shelter. 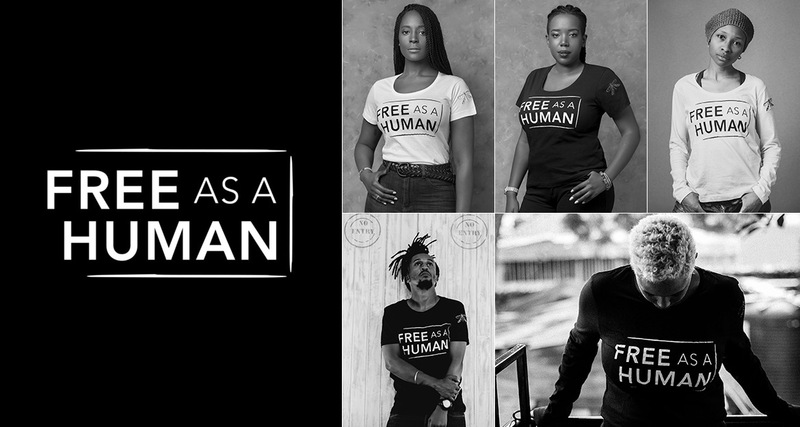 Free as a human uses fashion and art as a medium to raise awareness and create a movement that engages a cross section of members of our society and the global community, in an effort to transform how our communities think about modern slavery and advocate for every girl and woman’s right to freedom. Haart kenya is the only kenyan non-governmental organization dedicated to ending human trafficking- also known as modern slavery. Their work, which is focused on the kenyan and east african region creates awareness against human trafficking in the grassroots communities in nairobi and its environs, assisting victims of trafficking, prosecuting perpetrators in partnership with other organizations and networks to end modern slavery. Haart runs a shelter for young females who have been rescued from human trafficking. Kenya is one of the leading transit points and destinations for human trafficking in sub-saharan africa with victims coming in from as far as india and nepal. Haart kenya is doing something about this conundrum and uses art as a tool to create awareness and has a project specifically for this purpose. Shelters offer a place of refuge for victims of trafficking as soon as they are rescued. Haart kenya offers much needed immediate care for victims to be able to recover from the trauma of their experiences. Haart shelter offers client-centered and trauma informed care to girls who are between the age of 6-18 years. Due to demand, all t-shirts are available on pre-order for delivery within 4 – 6 weeks. 100% of the profits from the sale of these t-shirts are donated to Haart Kenya. All our t-shirts are made in Kenya from organic cotton from the Cotton Made In Africa initiative, which sustainably improves the living conditions of cotton farmers in sub-saharan Africa. RA International is Africa’s premier provider of site construction and management services for clients in oil & gas, mining and humanitarian operations, working in remote and challenging environments. A wide range of NGOs, governmental organizations, private enterprises and multinational companies rely on us for mission-critical support in the face of cultural or geographical challenges. We are equipped to operate across the continent. Whatever the circumstances, we deploy a business model that puts long-term community impact at the core. We believe that private companies really can make a significant footprint in some of the world’s most challenging regions – and have a moral obligation to do so. Our aim is to operate at all times on firm ethical principles and as a company we take our responsibilities to our employees, and our relationships with our suppliers very seriously. We operate an open door policy and if you’re in Nairobi and you’d like to see how we make our bags at first hand then please get in touch. Sandstorm Kenya is collaborating with us by manufacturing and providing retail distribution of the Free As A Human bags designed by Anyango Mpinga. Coming Soon.